Canine lymphoma is the most common form of cancer in dogs. It can initally be limited to one organ or can spread throughout the body. Many parts of the body contain lymphatic tissue, and the disease can appear in different forms. The most common target organs are primarily the lymph nodes, followed by the liver and spleen. The disease can also affect the gastrointestinal tract and, rarely, the eyes or skin. Middle-aged dogs are most at risk, often after the age of 7 or 8. Some breeds are more commonly affected, with the golden retriever, pit bull, Rottweiler, beagle and boxer often victims of lymphoma. In the golden retriever, there appears to be a specific inheritance pattern, although it is not yet completely clear. In the common form, a dog has a poor appetite, feels “off,” and often has swellings that feel large and firm, especially in the neck, hind legs, groin and under the arms. These are large lymph nodes, and the doctor will usually take samples of these to send to the laboratory. In the gastrointestinal form, the patient can present with diarrhea, vomiting, weight loss or loss of appetite. This disease is often very quick to spread and cause organ failure. The typical course from diagnosis to severe illness and death is often measured in months. In years past, we were unable to offer much more than cortisone tablets in an effort to make the patient comfortable for a short period of time. With the advent of chemotherapy, many owners choose to consult with a cancer specialist, or veterinary oncologist, to discuss options. Chemotherapy can be very effective at putting the disease into remission, sometimes for a long period of time, often without severe side effects. If you should ever suspect that your dog might be affected by this disease, be sure to consult with your veterinarian. 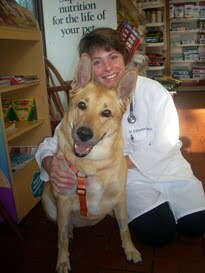 Often there is much we can do to be of help to you and your pet.